IBANYS Convention '18 is happening NOW! How Community Banks Can Answer Needs Of "Digital Generation"
IBANYS' 2018 Annual Convention is happening now and continues its three-day extravaganza with outstanding business programs, an exceptional exhibitor trade show, and an impressive array of knowledgeable speakers from various industries. Tonight at 5:30 p.m. will be our PAC Silent Auction, sponsored by Federal Home Loan Bank of New York, along with a keynote dinner speech by ICBA President & CEO Rebeca Romero Rainey. Tomorrow the Convention will conclude at 1:15 p.m. after presentations and a panel discussion. Full Convention updates can be found in the Convention section of today's newsletter. Meanwhile, IBANYS held our 2018-19 Officers' election this morning. The newly elected officers are: Chairman Tom Amell (President & CEO, Pioneer Bank), Vice Chairman Mike Wimer (President, Cattaraugus County Bank) and Treasurer/Secretary Tom Carr (President & CEO, Elmira Savings Bank). They will begin their terms November 1 and will join current Chairman Mike Briggs (President & CEO, USNY Bank) -- who will become Immediate Past Chairman -- to form our Executive Committee. Along with our new officers, we also have two new board members for 2018-19. Please join us in welcoming Steven Woodard (President & CEO, Alden State Bank) and Theresa Phalon (President & CEO, North Country Savings Bank) to the IBANYS Board of Directors. On behalf of our leadership and staff, welcome to our newly elected officers and directors who will help build on the foundation we have established and guide IBANYS into a profitable and successful future representing the interests of New York's community banks. IBANYS Chairman Briggs and Chairman-Elect Amell joined me in addressing the gathering -- as did New York State Financial Services Superintendent Maria Vullo, ICBA President & CEO Rebeca Romero Rainey and a full complement of outstanding experts. We will have more on our convention in next week's newsletter. Meanwhile, a number of the speakers' presentations from the convention will be available on our website soon at www.ibanys.com. Don't Miss This Fun Weekend -- For Great Causes! 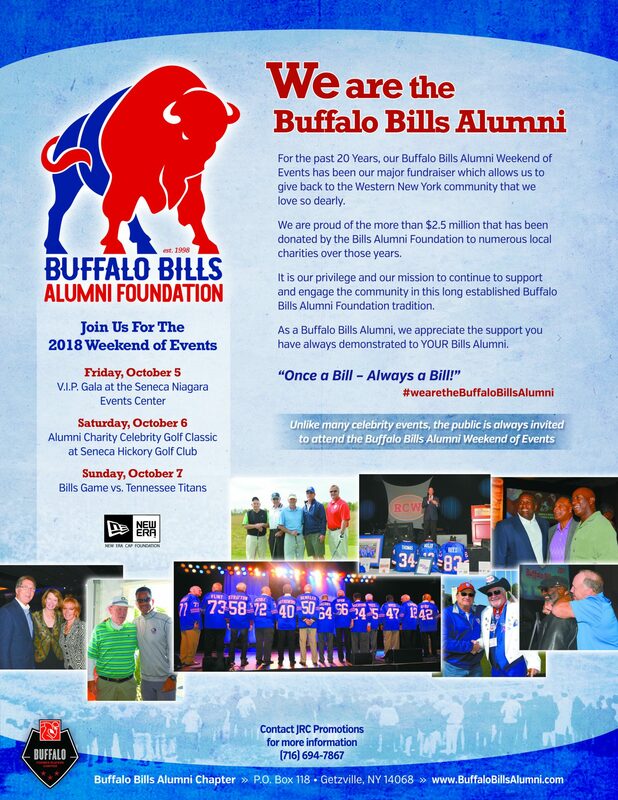 On behalf of Buffalo Bills Alumni Foundation President, Booker Edgerson, I want to make sure that you are aware of the following dates for the annual Buffalo Bills Alumni Weekend of Events. For full information, click the image or download the flyer. As always, thank you for your support of IBANYS and all you do for community banking. The second day of Convention was a busy one. The morning began with the Passing of the Gavel from Mike Briggs (President & CEO, USNY Bank), current Chairman of IBANYS' Board of Directors to incoming Chairman-elect Tom Amell (President & CEO, Pioneer Bank). We then elected two new board members for the 2018-19 year, Theresa Phalon (President & CEO, North Country Savings Bank) and Steven Woodard (President & CEO, Alden State Bank). The morning then continued with the beginning of the educational component of our Convention. We were honored to have intriguing speakers like Susan Powell Byrd, CEO of Westover Strategy, Inc., Tina Giorgio, President & CEO of ICBA Bancard, Jeff Cardone & Ben Azoff, Esq., Partner, Luse Gorman, P.C., among many others cover prevalent topics in today's banking industry. The speaker's presentations will soon be available to view/download from our website. We also had six 6-minute drills sponsored by: Wolf & Company, P.C., Pentegra Retirement Services, Promontory Interfinancial Network, Homestead Funding, T. Gschwender & Associates, Inc. and Travelers. Tonight our Convention will continue with one of signature events, the PAC Silent Auction. This popular convention feature offers organizations the perfect opportunity to showcase items from their region, while contributing to an essential committee that focuses and advocates for community banks in NYS legislative affairs. The PAC contributes to New York State candidates and officials who understand and support the vital role community banks play in our local and state economies, as well as our communities. We have received numerous unique items from areas across NY and the nation, bringing both variety and a story to the donated items. You won't want to miss chances to win items like 4 tickets to a Red Sox game, Oak Hill Golf Certificate, 3-piece Samonsite luggage set, Mackenzie-Childs Frost Pumpkin, among many more. The night will then conclude with a keynote dinner speech by ICBA President & CEO Rebeca Romero Rainey. The first day of Convention was filled with people from across the nation gathering at the Hilton Albany to set-up their exhibitor booths, prepare their presentations, and network with individuals. Unfortunately, the weather prohibited the golf outing but we are thankful to those that signed up and our golf sponsors. While the weather outside was dreary, it was upbeat and bright inside at the exhibitor trade show and following cocktail reception. Convention attendees had the opportunity to observe and network with vendors while waiting for the keynote dinner speech that was delivered by Albany Historian, Maeve McEneny-Johnson. The final day of Convention is just as packed and exciting as the first two! We will be continuing with the educational aspect of our program with dynamic speakers such as Josh Garcia from Ketsal Consulting, Chris Scaffidi of The Pacific Institute, among others. We will also have two more 6-minute drills, sponsored by CloudBnq & Trigen Leasing, LLC. Politico reports that women are running for office in record numbers in this year's legislative races in New York: 105 women will appear on major party lines for the Legislature's 213 seats (150 State Assembly seats, 63 State Senate seats). That's a 22-percent increase from the 86 who ran in 2016, and significantly more than the 91 who ran in 2006 -- the previous high. Among Democrats, their 196 legislative candidates include 80 women, up from 60 two years ago. 44 percent of Democratic state senate candidates are women. Among Republicans, the number of female candidates decreased from 26 to 25, and 13 of the 99 Republican candidates for Assembly seats are women. Governor: No Decision Yet On Extending "Millionaires Tax"
Gov. Cuomo hasn't decided whether the state needs the $4.5 billion in annual revenue from the so-called "Millionaire's Tax" due to expire at the end of 2019. "That's something we'll look at next year," Cuomo said. "We have to get more information and more numbers before you can make a decision." He has discussed with State Budget Director Mujica. Single New Yorkers earning $1 million annually and couples earning $2 million pay a state income tax rate of 8.82 percent -- slightly lower than the surcharge imposed by Gov. Paterson to raise revenue following the 2008 recession. If the higher rate is kept in place, the state could see a multi-billion dollar surplus after 2019, based on its updated financial plan. The budget division projects a shortfall in fiscal year 2021 less than a third of what could be generated from a complete extension of the millionaire's tax. State Comptroller DiNapoli reported a decline in the number of local governments facing fiscal challenges -- the third consecutive year the number of fiscally problematic municipalities has fallen. The report assesses a variety of indicators, including fund balances, cash-on-hand totals, borrowing and chronic deficits. DiNapoli also noted the number of municipalities in "significant fiscal stress" has more than doubled. 25 municipalities are deemed to be under a form of fiscal stress, including 10 counties, six cities and nine towns. They include Nassau, Monroe and Westchester counties, Niagara Falls, Poughkeepsie, Watervliet, German Flatts, Oyster Bay, Parish, among others. The Comptroller concluded: "Fewer local governments are considered fiscally stressed, but those with persistent financial problems are struggling to stay out of the red and fix their problems. While the results may be encouraging in some areas, there are municipalities that should focus on near-term financial risks and implement more prudent long-term planning." NYS Department of Financial Services Superintendent Maria Vullo addressed attendees at lunch today at IBANYS' Annual Convention in Albany. She joins our other keynote speaker for Convention today, ICBA President & CEO Rebeca Romero Rainey. Romero Rainey will address the convention this evening as our keynote dinner speaker . Together with her team -- and with the help of community bankers across the country including IBANYS members -- she led the fight to achieve the first meaningful and comprehensive regulatory relief for our industry since Dodd-Frank was enacted in 2010. S.2155, the Economic Growth, Regulatory Relief and Consumer Protection Act, was enacted earlier this year. 2018 Is A Crucial Election Year-- Have You Contributed to NYSIBPAC? This year's election may well be one of the most important in recent history for New York community banks. Control of the New York State Senate is very much up for grabs. Traditionally, the Senate -- under Republican control for most of the last half-century -- has provided a firewall for businesses, the financial services industry and particularly, for local independent community banks. IBANYS' state political action committee, NYSIBPAC, works hard to determine candidates and incumbents for state offices -- including the NYS Legislature -- who understand the needs, priorities and challenges of New York's community banks. This is the year to make certain you support our efforts -- it could make all the difference going forward. IBANYS joins with ICBA in urging community bankers to continue advancing two grassroots campaigns using ICBA's Be Heard grassroots resource center . Disparate Impact: Tell the Department of Housing and Urban Development (HUD) to amend its fair lending disparate-impact rule to meet the limitations imposed by the U.S. Supreme Court. ICBA's custom message calls on HUD to align its rule with the high court decision. Bank Secrecy Act: Community bankers can also use the resource center to call on Congress to introduce legislation that will streamline the BSA/AML framework and alleviate compliance burdens. ICBA and other banking groups called on the IRS to reconsider its approach to implementing the Tax Cuts and Jobs Act's 20 percent tax deduction for pass-through businesses. In a joint comment letter, they urged the agency to allow all permissible banking activities to be eligible for the deduction. Citing Section 199A of the tax law, the IRS's August proposed rule names various financial services that do not qualify for the 20 percent deduction, such as trust or fiduciary services, wealth management, retirement planning and possibly income from loans sold to be securitized. Businesses that have $25 million or less in gross receipts and earn less than 10 percent of those receipts from these services would be eligible for the full deduction, as would businesses with more than $25 million in gross receipts that earn less than 5 percent from those services. ICBA also called on the IRS to issue additional guidance raising the de minimis thresholds to a flat 25 percent and clarifying the treatment of loan sales, trades and businesses, and ancillary consulting services. New York community bankers: ICBA will continue working with policymakers to advocate a broad interpretation that ensures all Sub S community bank activities are eligible for the tax deduction. Comments on a proposed regulation affecting the small-business tax deduction for Subchapter S banks are due Monday, Oct. 1. Community bankers can use ICBA's Be Heard grassroots action center to contact the IRS and Congress. A provision of S. 2155 (the Economic Growth, Regulatory Relief, and Consumer Protection Act) that requires credit reporting agencies to freeze consumer credit reports at no charge took effect September 21. These security or credit freezes restrict access to credit files to reduce identity theft. T he Bureau of Consumer Financial Protection explains how consumers can contact the major credit bureaus to request a freeze (which must be granted within one business day.) Consumers may also place year-long fraud alerts, which tell businesses to check with customers before opening an account. View the details here. President Trump has nominated former Federal Reserve economist Nellie Liang to serve on the Fed Board of Governors. She also has served as the first Director of the Fed's Division of Financial Stability. Ms. Liang would join the administration's previous Fed picks: Chairman Jerome Powell, Vice Chairs Randal Quarles and Richard Clarida, and the nominated but not yet confirmed Michelle Bowman and Marvin Goodfriend. Ms. Liang was involved in crafting the post-financial crisis regulations, and some analysts believe she could be less likely to promote a significant rollback of them. Performance of first-lien mortgages remained largely unchanged during the second quarter of 2018 compared with a year earlier, according to the OCC. The latest Mortgage Metrics Report showed that 95.6 percent of mortgages included in the report were current and performing at the end of the quarter, compared with 95.4 percent a year earlier. The Federal Reserve hiked its benchmark interest rate a quarter point today, "upped" its anticipation for economic growth this year and next, and provided a "road map" of what lies ahead through 2021. The policy-making Federal Open Market Committee increased the fed funds rate 25 basis points, taking the rate to a range of 2 percent to 2.25 percent -- where it last was in April 2008. It marks the eighth increase since the Fed began normalizing policy. Recent college grads have grown up with innovation and therefore rush to grasp the most recent and most noteworthy gadget, application or social network. That comfort and characteristic trust with technology puts them in particular danger for information misrepresentation when the cyberthieves are getting continuously voracious. This well-informed age doesn't know existence without innovation and frequently don't offer idea to their activities or the threats of online movement. They see fraud and misrepresentation as unavoidable and have been prepared that they are not at risk for extortion relating to their credit cards or bank accounts. This mentality regularly keeps them from exploiting fraud administration which shields them from potential misrepresentation and prevents it from wreaking money related destruction. What they don't understand is the long, agonizing procedure engaged with recouping from having their identity stolen. It's no secret in the banking world that the financial services industry is the main focus for cybercrime. The risks of phishing and other social building scams have stood out as truly newsworthy and alarmed the general population lately. Today, youthful customers comprehend that data fraud is a major issue and that their dangers extend to their web-based shopping, banking and social media. Numerous twenty to thirty-year olds have turned into a casualty of fraud. A report composed by the Federal Trade Commission (FTC) found that millennials are the main casualties of character scams. A year ago, they lost more cash to extortion than seniors. The report likewise uncovered that in excess of 30 percent of individuals in their twenties and near 40 percent of those in their thirties experienced occasions of misrepresentation. It is likewise important to note that last year, 39 percent of cybercrime victims were minors. This gathering speaks to the up and coming age of customers who will have fraud assurance on their radar. Customer Identity Protection gives enhanced security and notoriety to the bank Keyloggers are a type of spyware that steal each keystroke composed into an application or browser. They are a primary segment in a larger part of malware. Their principle design is to acquire credentials generally downloaded because of a successful email or online phishing scam. During recent years, the financial world was hit hard by financial trojans, which much of the time are built with keyloggers aimed at hacking bank customers. This malware spreads in millions of spam messages every day to harvest the credentials of its victims. As indicated by Consumer Affairs, millennials will probably fall for computerized scams than more established adults. Once a banking customer unconsciously downloads a keylogger, their bank user name and password can be caught. At the point when an account is obtained, digital cyber thieves can rapidly exchange and take reserves. As indicated by one examination, account takeover extortion tripled in the most recent year, achieving a four-year high, with one out of five misrepresentation casualties losing cash. As indicated by the CEO of Advanced Cyber Security Corp., Daniel DelGiorno, enhancing customer instruction in regard to phishing attempts is one approach to help lessen the probability of a keylogger advancing onto their PC and mobile devices, however cybercriminals are continually enhancing their strategies and finding better approaches to deceive unsuspecting bank customers into tapping on an infected link. In an ongoing review, customer administration and security were the two most vital variables banking customers refer to when remaining with their current financial institution or relocating to another one. Offering Identity Theft Protection as a customer advantage, answers an incredible need for recent college grads, as well as for the majority of your customers who are banking, shopping, messaging, socializing with friends and family and browsing the web. One report found that 74% of buyers currently utilize online banking. Noting the requirement for character insurance demonstrates to your customers that their security is your top priority. Daniel DelGiorno concludes, "There are numerous identity theft protection plans on the market, however, a large portion of them offer devices that alarm the customer after their identity has just been stolen. ACS CyberIDLock Identity Theft Protection Plan is the only proactive plan that provides a tool that can help counteract data fraud and identity theft with our patented keystroke protection software to block 100% of keyloggers/spyware." The Bond Academy, presented by ICBA Securities and Vining Sparks, is designed to provide community bankers with the basic knowledge needed to help plan and create effective investment portfolios. A high performance investment portfolio can provide a noticeable increase to your bank's bottom line. The learning objectives of Bond Academy are aimed at providing you with the tools to understand how debt instruments work and their overall role in complementing the entire balance sheet. This all new curriculum has been specifically designed to equip a new portfolio manager with basic portfolio management issues. Specifically, fundamentals of bond pricing, valuation, and selection will be covered extensively. Who should attend? CPAs and those new to their roles as investment officers, cashiers, controllers, and internal control professionals will benefit the most from Bond Academy. New directors serving on the investment or asset-liability committee will also find this course beneficial. No advance preparation is necessary. You'll learn the basics of the bank portfolio investment process. Breakfast provided in the Atrium Café for those staying at Embassy Suites. Luncheon provided on Monday. Participants will receive a debit card for lunch on Tuesday. In 1996, two successful businessmen, E. Philip Saunders and Dan Gullace, purchased an established bank in Rochester, New York. They renamed it Genesee Regional Bank (GRB) with a vision of re-establishing a community bank presence, and helping to grow small business in the Rochester region. From this vision has emerged not only a successful financial institution, but one known for being a trusted advisor to its small business clients in a wide range of industries. With that entrepreneurial spirit in mind, President and CEO Philip L. Pecora leads GRB with a customer-centric philosophy that sets the bank apart as a powerful advocate for its clients. GRB's original vision of growing local businesses has expanded to include helping individuals, nonprofits, and municipalities achieve their financial goals. The bank has continued on a consistent growth path, increasing its assets more than ten-fold since 2003. The 2013 addition of three residential mortgage companies to the GRB team brought yet another critical service to the bank's customers and the local community. GRB's residential mortgage team has grown rapidly and GRB is now one of the leading mortgage lenders in the region. With assets now topping more than $550 million, GRB offers competitive products and rates -- but with the added benefit of hometown knowledge, service and decisions. One of the "Best Companies to Work for in New York"
One of Rochester's "Top Workplaces"
GRB is launching an aggressive community-focused brand awareness campaign in September 2018 to encourage businesses and individuals to consider the benefits of working with a local, independent financial institution like GRB. Mrs. Michael Maloney. In their own words, these customers discuss the importance of receiving local support from GRB to achieve their personal financial goals and enable growth for their Rochester-based businesses. The campaign reinforces the bank's mission to provide products and services exclusively to the Greater Rochester region - working to keep us all, as the campaign concludes, "ROC" solid. The commercials and extended interviews with each customer can be found at www.GRBbank.com/community. Dan Morgenstern, founder of Radio Social and a GRB customer featured in the campaign said, "To bank with somebody that's outside of our community doesn't necessarily help our community. What's critical for us is depositing our dollars into a bank like GRB that turns around and supports the local economy and local business. Rochester can't grow if we don't have a community bank. Because outside banks wouldn't have done what we needed for Radio Social. GRB is unique. They really understand and care about the success of the local market." "Community banking is really about reinvesting into the Rochester community and really being focused on one market," said Frank LaMar, co-founder and CEO of Hybridge Dental Implants, a GRB customer and campaign feature. "I think having a bank like GRB whose focus is one market like Rochester, New York, is really much more profound to the business owners of that town compared to, frankly, what we've had in the past with large banks." GRB has ambitious plans to continue its growth, and continue driving the success of businesses and individuals in the Greater Rochester community. Learn more at www.GRBbank.com. ACS is p atent holder of the keyboard encryption technology, is a security partner with McAfee/Intel. ACS services include dark web scanning, fully managed recovery if a breach occurs and breach protection insurance policies. For further information, please contact Stephen DelGiorno: (866) 417-9155 or stephen@advancedcybersecurity.com. Or, visit the website at www.advancedcybersecurity.com. . . .That in 1974, the year IBANYS was formed, the Chairman of the FDIC was Frank Wille? He chaired the FDIC for six years, beginning in 1970, and he previously served six years as New York State Banking Superintendent and Chairman of the State Banking Board. Mr. Wille later was C hairman and CEO of the Greater New York Savings Bank.